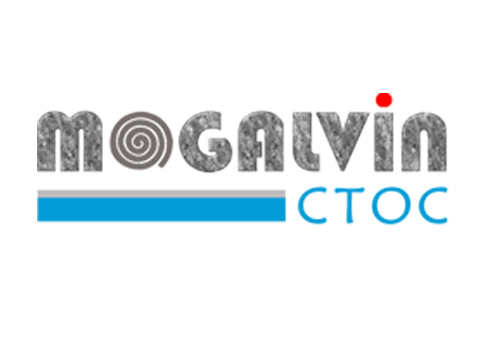 Mogalvin is the brand name of the hot-dipped galvanized steel produced by UNICOIL. The steel strip is coated with zinc using a continuous and controlled process. The tight metallurgical bond between the steel and coating takes place in a continuous galvanizing line supplied by Danieli, Italy. This process results in a material with the strength and formability of steel and with the corrosion protection provided by zinc. The zinc coating protects the base metal from external corrosive elements in two main ways, by acting as (1) a physical barrier and (2) a sacrificial anode. Mogalvin is available in various base metal grades and coating weights, and comes in special surface finishes tailored for specific applications. It is available as skin-passed and as-coated (regular) surfaces for the most demanding and critical surface applications, and can readily be painted when the appropriate pretreatment is performed. To prevent staining during storage and in transit, the galvanized coils are lightly oiled or subjected to online chemical passivation treatment. Mogalvin is treated with Hexavalent chrome passivation. “Mogalvin Trichrome” is treated with Trivalent chrome Passivation, conforming to ROHS requirements. “Mogalvin AntiBacterial” is coated with a special layer of epoxy coating combining the anti-microbial compound and zeolites in the epoxy resin and is recommended for HVAC ducting applications. Mogalvin and its other brands are widely used in many applications in the construction, HVAC, appliance, automotive, and other industries. Mogalvin and its other brands are produced in conformance with international standards and specifications, such as SASO ASTM A653M-15, ASTM A653/A653M, EN 10346, and JIS 3302. Mogalvin and its other brands are produced in commercial grades (CS), forming grades (LFQ/FS), or structural grades (SS 33, 37, 40, 50 and 80). Note: Restricted gauge ranges and customized thickness tolerances can be offered on request. What is the Lead-Safe Limit in Zinc? The maximum safe limit for the amount of lead in zinc specified in ASTM A653/A653M is 0.009% (90 mg/kg). Exceeding this limit may have a negative impact on the product performance, such as delayed adhesion failure and spangle darkening. Further, excess levels of lead are harmful to human health, especially via the inhalation of fumes and dust generated during the welding and grinding operations performed during fabrication using galvanized steel and when this product is used in applications involving direct contact with human beings or indirect contact via the air, water, and soil, such as in storage tanks and water pipe lines. UNICOIL strictly complies with the lead-safe limit in zinc, and actually provides product with much lower values of lead (e.g., 60 mg/kg). UNICOIL uses high-purity zinc (minimum of 99%), which is procured from vendors approved by the London Metal Exchange. What is the Mandatory Minimum Zinc Coating of Galvanized Steel? SASO – Saudi Standards and Metrology Organization has adopted ASTM A653/A653M for the Galvanized steel and made changes to suit the local conditions. The mandatory Minimum zinc coating as per SASO ASTM A653M-A1-15 is 60 gsm (grams per square meter) in order to deliver the minimum expected product performance and life span. Applications that are closer to the sea, offshore, or in urban areas will require a heavier zinc coating. The thickness of the steel also significantly affects the product performance and its life span, and should be determined based on the final product end use and the site of installation. To prevent staining during storage and in transit, the galvanized coils are lightly oiled or subjected to online chemical passivation treatment. Hot-dip coatings are specified in a wide range of coating mass categories. Mogalvin is available in thicknesses ranging from 0.18 mm to 2.00 mm and in widths up to 1300 mm. Mogalvin is also available in slit widths and sheets.